Collisions are accurately modeled in Atlantic Fleet. The size of each vessel, their speed, armour and the angle of impact all determine the amount and where damage will be dealt. Incoming vessels usually suffer bow damage while target ships are damaged at the point of impact. Capital ships can easily cause fatal damage to smaller vessels, such as destroyers, when ramming. However both ships will take some amount damage regardless of size. In addition escorts and other ships can ram submarines at periscope depth. Collisions also occur between friendly units, especially those in tight formations, maneuvering sharply or with damage to their steering. Screenshot shows HMS Glowworm colliding with Admiral Hipper which occurred on April 8 1940. For those keenly watching the unveiling of ships over on the Facebook page you can add Admiral Hipper Class heavy cruiser and G Class destroyer to the list of ships available in game. This game looks very good!But what about Pacific Fleet?There will be a sequel or an upgrade which will bring new features from Atlantic fleet or you will stop support it? 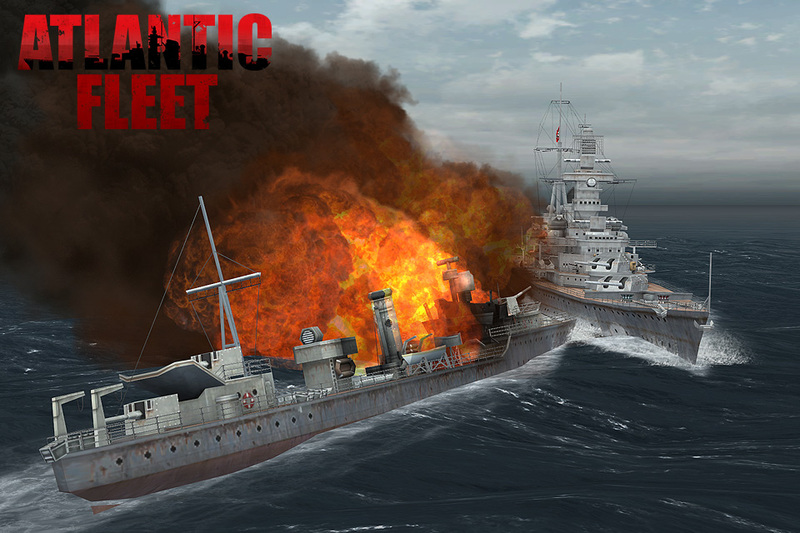 Atlantic Fleet is the sequel to Pacific Fleet. So much has been added that we would have to make a Pacific Fleet 2 in order to bring all these new features into the Pacific theatre. Do you have a ball park time frame as to when you will release the new app? Aiming at Feb-Mar for release. There’s a few strange bugs still lurking about. Atlantic Fleet’s collision detection is much better. Loved PF can’t wait for AF. Similar but a bit different. There is now a targeting system where you can tap any ship and set guns to aim at (and set elevation) to that ship. You just need to fine tune the shot after that. Did you know when a ship collides bow first it has less chance of sinking? if a ship gets rammed from the side it will suffer heavy damage! that’s why if the titanic hit the iceberg front on it would have had a 76% can of giving time for a ship to come to aid and save everyone on-board! Correct. This is modeled in the collisions. Speed of both ships, angle of impact and where a ship impacts all determine how much damage is done. LANTFLT absolutely anticipated! How come their are no PTBoats in PACFLT? Pacific Fleet is limited to 7 classes per navy. Atlantic Fleet has many, many more ship but still no PT boats unfortunately. Smallest ships we’ve chosen to include are the corvettes. when it is coming out? No set date yet. We’ll release once it is finished and we’re happy with it, but it is getting close now.